Applications: For mounting on fixed machines, such as bench grinders, polishers and other motorised shafts. They can be considered as gentle action grinding wheels giving controlled rates of stock and coatings removal as well as de-burring and removing casting flashing. 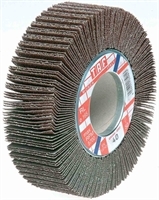 Product Notes: Available in a wide range of grades, but if finish is more important than speed of metal removal, then it is worth considering a non-woven or a combination flap wheel. Cloth flap brushes give a gentler action than grinding wheels or belt machines, so you can choose 2 grades coarser for a similar effect. Increased speed will give a finer finish. Max Speeds: 165mm 5,700rpm. 200mm 3,000rpm. 250mm 2,800rpm.